Keep up to date on the latest news and information posted to wconline.com with our RSS feed. Our blogs feature another outlet for you to read information about ever-changing industry rules and regulations, new technology and tools, share innovative ideas/solutions for industry challenges. Articles on continuous insulation, the building envelope, green building and more. Reports from around the nation as it relates to architects. The latest in green and design oriented products. This profile features a North American architect in a Q&A format. Kevin Bush reports on the varied and newest products available to drywallers. Pete Battisti provides agreeable business advice. Technical and current information about the standards and practices in the drywall industry. Patrick Webb writes about interior plaster, with an emphasis on historical and decorative applications. Specialist Greg Duyka reports on software options and tools available for contractors. This column discusses important industry concerns and trends. Safety consultant Michael Rich reports on equipment, creating programs and a safe working environment. Plasterer William Rogers discusses the work force and the hawk-and-trowel trades. Chris Dixon reports on green-related themes, code updates, innovations and products within the trades. Albert Carrillo elaborates on stucco, including continuous insulation and EIFS. Robert Thomas offers invaluable editorial on EIFS trends and issues. Editorial Director Mark Fowler comments on contracts, codes and labor issues. Kevin Kennedy, President of Beacon Exit Planning LLC, discusses how to successfully exit your business. The information is not intended to be legal, accounting, insurance or tax advice. The science of a high performance building envelope through the development of codes and processes. Learn about the systems and methods to achieve better STC ratings. See the latest new introductions into everything gypsum related, such as products, tools, software, codes and more. Projects that focus on the exterior work being done by contractors. Learn about fire stopping agents and how these play a role in a project. The latest building system that is now at the forefront of the green residential movement. Read about the many different kinds of insulation are now available to the contractor. Interesting reports from the inside of the job site. The emergence of steel/metal framing on job sites continues to grow. The most up-to-date industry news releases from manufacturers, dealers, contractors and more. Features that are exclusively found on wconline.com. Plaster has been a proven wall system that is decorative, sound absorptive and durable. Walls and ceilings construction products that you can’t do without – from drywall to plaster, you can find it here! A collection of new products recently launched in the industry. Check out the image galleries to see slideshows of the new products! From the Levels of Finish to faux finishes, read about the latest. Learn more about these hand-trowelled trades and what’s new in products, codes and energy efficiency. 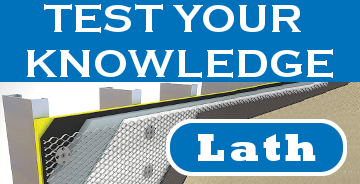 From hand tools to power tools, from BIM to estimating software, learn what is available. The latest products, hand and power tools, safety equipment and more. Newer products/materials present a new realm of possibilities for the finishing contractor. The Walls and Ceilings product of the month.